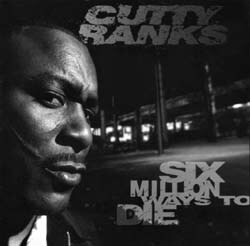 PAPA ROBBIE.NET: CUTTY RANKS:"THE STOPPER"
Cutty Ranks (born Philip Thomas) is a former butcher that became one of the first to pose an actual challenge to the dominance in the ragga world to Shabba Ranks. A representative of the sound system genre in the early '80s, he joined with Donovan Germain's Penthouse label in 1990, with a stone voice sound, much like Shabba's, running over the "gun talk and slackness" common to this era of ragga. Ranks also makes use of relatively lesser used beats to set himself apart from the other DJs on the scene. The two major albums to look for are The Stopper (Fashion) and Lethal Weapon (Penthouse).